Woodland Manor is an enchanting venue, perfect for private and corporate Christmas parties. Our beautiful manor house provides a home-from-home feel, first class catering and exemplary service. Despite our secluded location, we offer uncomplicated access to many major cities, including Cambridge, London and Oxford. Woodland Manor is just two miles from Bedford town centre and the well-connected local train station. We are easy to get to and from the A1 and M1, and have free parking for some 100 guests. Located in the heart of rural Bedfordshire, our Christmas party venue is available for exclusive hire, with flexible seating and private dining for as many as 170 people. You can also book a joiner party, which provides a relaxed evening of wonderful food, drink and festive merriment – as well as a late night disco. If you’re planning a corporate bash, we work with professional companies that can help to stage sensational office Christmas parties. Parties are priced at £37.95 per person. Exclusive venue hire, which requires a minimum of 60 people, is available for £49.95 per person. Woodland Manor is also available for Christmas lunch and Christmas Day lunch. 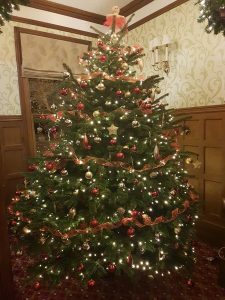 With a real fire crackling in the lobby and festive music playing softly in the background, our delightfully decorated manor house provides a cosy Christmas backdrop, perfect for dining at this time of year. Christmas lunch is available from Monday to Thursday throughout December and is priced at £29.95 per person. Christmas Day dinner is priced at £82 per person. Woodland Manor is available for Christmas parties every Thursday, Friday and Saturday throughout December. Joiner parties are priced at £37.95 per person. Exclusive venue hire, which requires a minimum of 60 people, is available for £49.95 per person. Christmas lunch is available from Monday to Thursday throughout December and is priced at 29.95 per person. Christmas Day dinner is priced at £82 per person. To book, please call 01234 363281 or email conference@woodlandmanorhotel.co.uk using the form below.